Let me start by saying what a pleasure it has been to be a part of such a wonderful organization for four years, and to have had the privilege of leading the club for three of those years. This annual review will in many ways seek to demonstrate the positive trajectory of SCM over the course of the last several years, and to detail the significant changes that are about to take place in the near future. Coming back from my junior year internship, I sought to utilize the newly acquired knowledge that I had obtained to teach our SCM members elements of being a successful analyst. The fall semester of 2017 was marked by an emphasis on several of the most important tools in the security analyst’s toolkit, namely techniques such as Porter’s 5 Forces & Value Chain Analysis to contextualize the operating environment for a given firm or group of firms. Students at the 5Cs are particularly well-equipped to perform this holistic analysis given their liberal arts backgrounds. Furthermore, our members delved into the study of companies KPIs (Key Performance Indicators) to figure out what drives their financial results. Following the fall semester’s focus on high-level company and industry analysis, we began the spring semester by going granular – single firm operating models. Over the span of approximately two months, our members learned the entire process of model construction; beginning with industry and firm analysis, then KPI estimation, to inputting historical financials to identify important trends, formulating various scenario analyses, linking the assumptions to the operating model, comparing model outputs to consensus to determine source and magnitude of variance, and finally valuation exercises (both idiosyncratic and versus peers). Building upon operating models, we decided to reverse the process through a strategy known as Expectations Investing. Whereas most analysts spend their time building models of various complexity and pushing their assumptions into the future, expectation-style investors play a very different game. Rather than trying to determine the correct value of P (the current stock price), those schooled in the expectations mode of investing take P as a given. The analyst then examines the consensus assumptions that produce P in order to determine whether or not they find the assumptions reasonable or not. Hence, the expectation investor is basing his/her investment decisions solely off of magnitude of variance from consensus assumptions. The first few months of 2018 have so far been marked by a return to volatility, beginning with the sudden, sharp sell-off in early February. As a club we contextualized some of the most notable components of the pullback, which included the implosion of inverse volatility products (i.e. SVXY). In order to understand the collapse of such products, we introduced the concept of “black swans” in a multi-part lecture. Turning from the educational component of SCM towards the unique hands-on approach that the club provides, it has certainly been a busy year in this regard. SCM was invited to participate in the CFA Undergraduate Research Challenge, which culminated in a presentation in downtown Los Angeles. In February the club presented for the third year running at the annual BMGI (Bill & Melinda Gates Investments) Student Investment Pitch night. 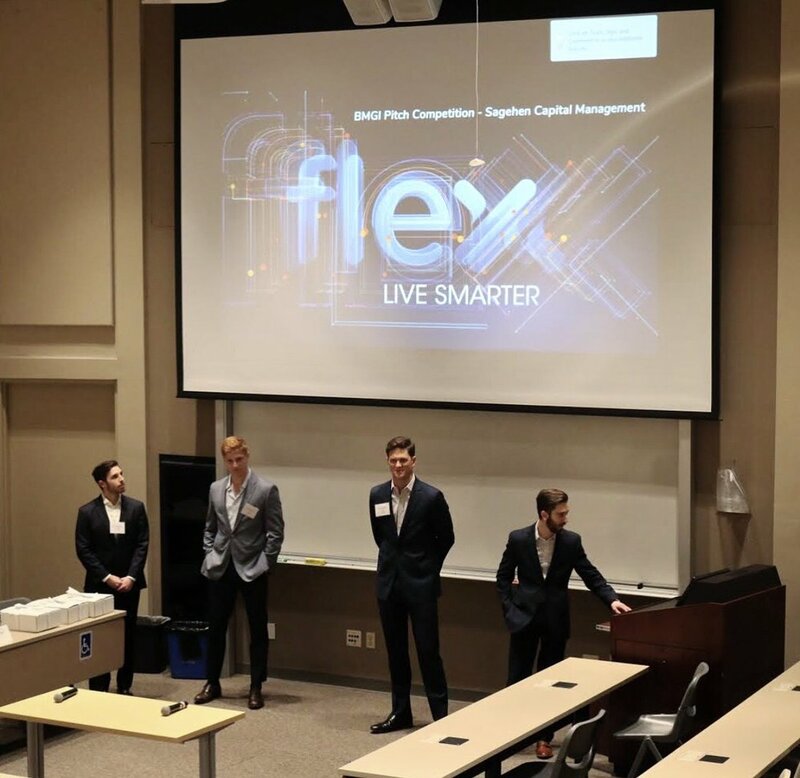 Lead by Sterling Schwartz, Sam Glazer, Joseph Scheuer, and Bryan Lynch the club pitched a long position in Flex (FLEX), a leading EMS (electronic manufacturing services) firm. The judges decided to award SCM as this year’s winning investment club. The final investment competition that SCM participated in was the USC Value Investment Group Pitch Event in April. SCM sent two teams; team 1 included Sterling Schwartz, Joseph Scheuer, and Ben Sacks who presented a short position in clothing subscription box company, Stitch Fix (SFIX), while team 2 pitched a long position in leading energy producer Diamondback Energy (FANG) and was composed of Thomas Anastos, Diego Vergara, Eric Oregel, Will Abele, and Efrain Gonzalez. Several other developments that took place within the past year are worthy of note. In order to raise awareness of the talent of our member base, I have sought to forge relationships with a variety of financial services firms and their recruiters. By doing so, we have built recruiting pipelines between our club and several top tier investment banks, consulting companies, and asset managers. These relationships are natural means of talent acquisition for the firms, and serve as an effective way of allowing SCM members to network and find internships and full-time employment opportunities. Over time I expect this to be a very fruitful endeavor. I am pleased to announce the upcoming transition of SCM leadership. For the 2018-2019 school year, SCM will have a dual-leadership structure headed by Sam Glazer (Pomona Class of 2019) and Joseph Scheuer (CMC Class of 2019). I have confidence in these two individuals and their ability to take the club to new heights given their demonstrated dedication to the club and interest in the financial markets. Since SCM was founded in 2001 by our primary benefactor and Pomona alumnus, Marcel Houtzager, our club has been operated and funded by means outside of the Claremont Colleges. I am excited to formally announce a major restructuring within SCM that will further bolster our capabilities. Going forward, SCM will manage capital that has been raised by a variety of investors, and will be held within the Pomona College Endowment infrastructure. Our current investors include 5C alumni and friends of the colleges, a list we expect to grow over time. Through their generous support, our investors have allowed SCM to further build our brand and asset base. As SCM enters its 18th year since inception, the club is at all-time highs. This feat has been accomplished by all of our members who participate and add value to our bi-weekly meetings, make presentations, and compete in investment competitions. With a new fund structure in place and a qualified leadership team ready to take the reins, the club is in an excellent position. I would like to thank all of our members, our alumni, and SCM’s investors for entrusting me with the stewardship of the club for the past three years – I could not be more grateful for the opportunity, and will never forget this experience. May the alpha be with you. As SCM prepares for our formal relaunch next semester with the backing of Marcel Houtzager, the fund is actively engaging with additional investors, including alumni and friends of the college. Sam Glazer gave a presentation on Spark Therapeutics (ONCE), an emerging biotech company developing novel treatments for a variety of diseases using genetic therapy techniques. To advance the presentation, click on the image. During our weekly meeting we announced a very exciting restructuring of SCM. Going forward, Sagehen Capital Management will invest assets on behalf of its investors through the Pomona College Endowment. This will provide an institutional framework to implement, track, and report on our investments to our limited partners. SCM's initial backer, Marcel Houtzager, will remain the anchor investor in the fund, as we seek additional capital from alumni and friends of the college. Our mission will not change as a result of this new structure. For the past few weeks we have been focusing on the short side of the book, seeking to identify characteristics of good short opportunities and the type of analysis required. To advance the presentation, click on the images. Here we introduced the concept of Expectations Investing, which is a process to determine the key drivers of a company, analyze the ecosystem in which the firm operations, and allows investors to understand how to generate above market returns by anticipating revisions in key operating assumptions. To advance the presentation, click on the image. SCM will be sending several teams to the USC VIG Pitch Competition this year. 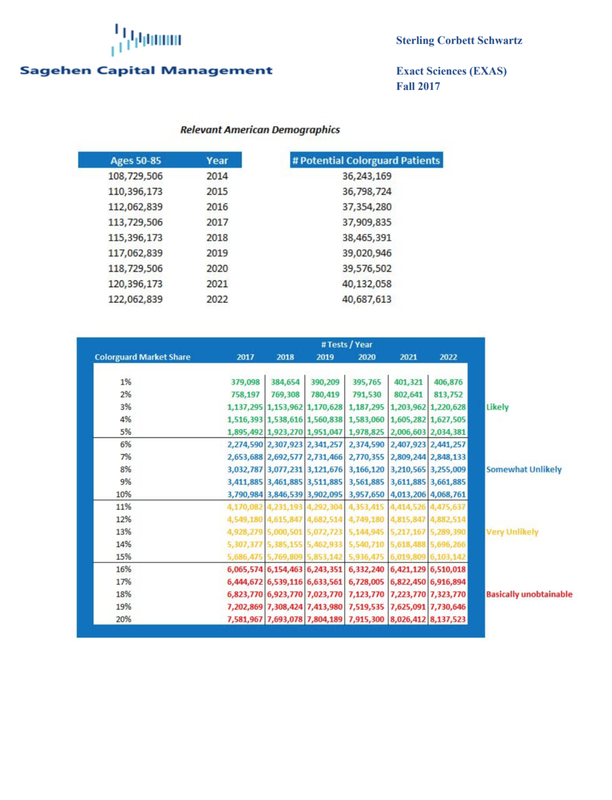 Here are the 2-page investment summaries. SCM participated in the fourth annual Bill & Melinda Gates Investments Student Pitch Night earlier this week. Lead by Sterling, Sam, Joseph, and Bryan the team recommended a long position in FLEX. A panel of judges selected FLEX as the winner of this year's event following the presentations. This year SCM will be sending two teams to the USC Value Investing Group's Annual Stock Pitch Competition. Lead by Sterling Schwartz, Joseph Scheuer, and Ben Sacks, SCM Team 1 will be presenting a short on Stitch Fix (SFIX). The full presentation can be viewed on the portfolio section under "Stitch Fix Presentation." To advance slides, click on the images. * Dave Wallace – Managing Director of the Pomona College Endowment, who has spoken to the club on several occasions, and provided insight into how the college prepares for various market environments. The theme this year was "2018 – Party Like it's 1999 or 1984 Morning in America?" as the panelists responded to questions about where they see the market and the economy following the recent volatility and policy changes enacted. Over the last few meetings we have been building up our understanding of how to think about financial models, what drives them, and how we can use them in the investment process. Feel free to use these slides as a reference in your investment pitches. To advance slides, click on the images. In case you missed the meeting, or would like to review the content again, feel free to go through the presentation by clicknig on the images. SCM was proud to participate in the 2018 CFA Student Pitch Event. The target company this year was Flex (NASDAQ: FLEX). Our team was represented by Sterling Schwartz, Joseph Scheuer, Bryan Lynch, and Sam Glazer. To see the team's presentation, click through the slides here. During our meeting today two of our members presented the final version of their work on the LNG market. To advance the presentation, click on the images. Several SCM sophomores participated in Point72 Asset Management's annual pitch competition. The participants were asked to present a company in the cruise industry, and ultimately selected Carnival Cruise Lines (CCL). The presentation is here–to advance slides, click on the image.